I confess-I like few things better than going out to lunch, especially in the spring and summertime when my companion(s) and I can grab a table outside and soak up the day's warmth. Give me some good company, an innovative lettuce-based creation, a bottomless glass of iced tea and a good friend-and I am one very happy lady � especially if my salad has a bona fide Mexican flair! Fix one of these meal-sized salads for your best friend, your mate, or, increase the quantities and make one for your entire family or for a crowd. They're all suitable for either lunch or dinner, depending on your appetite, preference ... and the weather, of course. And, for the utmost in dining pleasure-pick a warm day and al fresco with a vase of fresh flowers on the table. Take off your shoes so you can wiggle your toes. Put on some Mariachi or Flamenco guitar music. Or perhaps, something soothing and mystical from the Andes of Per�. As you dip your fork into your salad, picture yourself on a tiled terrace high above the sea. Listen to those waves as they break on the rocks below you. Inhale the aroma of Mexico. Look up to the skies and imagine a formation of pelicans banking around the corner of the bay below you. Sigh deeply and relish that first bite as the magic of Mexico flows through your veins. As a last aside - these are NOT difficult recipes. So don't be timid! It's Spring! Get with the program, and do it Mexican style! I created this recipe on a camping trip to Baja when my kids were little, because I'd forgotten to pack any vegetable or olive oil in our motor home. Since we'd shopped in Ensenada on our way south, I did have plenty of avocados, so I decided to let the natural oils inherent in the avocados act as my salad oil. It worked! They blended with the other ingredients to make create a remarkable, but filling salad. Great when you're in the mood for something not-too-heavy but substantial enough that you won't be hungry in a couple hours! For a dish that started out as a semi-accident, this turned out to be really, really good. It serves eight. Cut avocados in half. Remove seed and peel each half. Cut into one inch chunks. 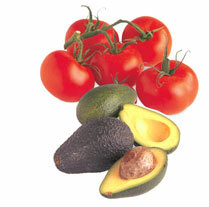 Place in medium sized bowl with tomatoes, onion, red and green bell peppers, radishes, garlic and cilantro. Sprinkle with lime juice, salt and pepper. Toss gently. Refrigerate, covered up to three hours. Line chilled salad plates with romaine leaves. Spoon avocado-tomato mixture on top of each bed of lettuce. Add a sliced egg to each serving and sprinkle lightly with pepper. No, this is not a replica of the taco salad that arrives in a greasy bowl made from a deep-fried flour tortilla and contains more calories than most adult women are supposed to consume in a 24-hour period! This recipe is lighter and more authentically Mexican. It makes an outrageous lunch or light dinner for two hungry people. It can be made with either beef, chicken or turkey, the recipes for which can be found in the Tacos, Tacos y M�s Tacos!. If you want to serve it meatless, then just leave out the meat! Vary the salsas (use either ready-made or a recipe from this book) to suit the meat and your mood both. After you have your meet prepared, this salad should take you no more than 20 minutes to prepare. Feeds two as a meal. On the bottom of a large salad bowl, layer shredded meat, pinto beans and lettuce. Top with olives, green onions, salsa, and tomatoes. Refrigerate up to one hour. In a small bowl mix salsa and salad dressing. Just prior to serving, Add avocado, grated cheese and tortilla chips as top layer. Toss salad gently and serve immediately. The combination of flavors is original and it's a delicious, satisfying meal without being heavy. Even if you aren't a pork lover -- be courageous and give this recipe a try. It's not fatty at all. Trust me -- you'll be astonished and you'll do yourself proud. The recipe for Carnitas is directly following this one. Serves two hungry people for lunch or a light dinner. Use hot, freshly made carnitas (recipe immediately following) or heat left-over carnitas in saucepan or microwave until steaming. On the bottom of a large salad bowl, layer carnitas, olives, green onions, radishes and tomatoes. Add avocado, salsa verde and lettuce as top layer. In small bowl mix together sour cream sauce, lime juice, olive oil, garlic powder, basil, salt and pepper. Place the fried tortilla strips on top of the salad. Pour dressing over all, toss gently and serve immediately. I love to cook carnitas for any sized crowd. It's requires little preparation time, which is a big plus and actually, I'd have to say it's Nina and my favorite birthday party fare. 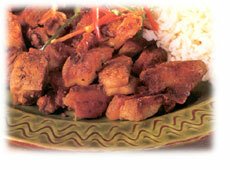 The pork is tangy, crispy but not greasy (the way I do it) and makes a terrific fiesta dish. As a buffet, serve a platter of steaming carnitas with corn and flour tortillas, and have your guests make their own burritos with flour tortillas filled with the succulent pork and an array of the following condiments: grated cheese, sour cream, chopped green onions, sliced avocado, cilantro sprigs, sliced radishes and salsa. This recipe for carnitas serves eight to ten. Make it for a crowd, and then reheat the leftovers for Hot Carnitas Salad! It's to die for! This salad is another winner. The carne asada (marinated flank or skirt steak) is superb, low in fat and this salad is a perfect way to enjoy the subtle flavor of the meat. The recipe for carne asada is in the Carne Asada Fiesta archive of MexCocina (link). Serves two hungry people for lunch or a light dinner. On the bottom of a large salad bowl, layer carne asada, green onions, salsa, and tomatoes. Add grated cheese and lettuce as top layer. Refrigerate up to one hour. Prior to serving, add salad dressing, salt and pepper. Toss gently. Line two salad plates with tortilla chips. Serve salad onto the plates. Top each serving with half the guacamole mixture and half the sour cream sauce. Place an olive on top of each salad and serve immediately. Now here's a new treat with a northern Mexico flair! Grilled Fajitas Salad combines the unique flavors of jicama (a delicious root vegetable found in specialty grocery stores) and Mexican pepitas (toasted pumpkin seeds) that are totally Mexican with western hickory-smoked chicken and a few other eclectic treats. Even the dressing, a not-overwhelmingly spicy chile vinaigrette will surprise and delight you. The recipes for Fajitas can be found in the MexCocina archives. If it's a beautiful, warm day-eat outdoors. Barefoot - with Latin music playing in the background. Serves two hungry people. Marinade chicken, beef or shrimp in hickory marinade for one half hour. Grill, either under the broiler or on the barbecue until done. Slice chicken or beef (not shrimp) into thin strips and chill. Saute red bell peppers in skillet. Remove and drain. Saute onions. Remove and drain. Place at bottom of large salad bowl. Layer with all other salad ingredients. Chill for up to thirty minutes. In small bowl, stir together all ingredients for dressing. Pour over salad and toss, adding chicken, beef or shrimp last. Serve immediately on chilled plates. The locals call La Paz, " the port of illusion." On a recent visit there, I asked our waiter at dinner why this was so. His eyes got all misty and dreamy-looking and he gazed out towards the pelicans who were gliding back and forth under the almost surreal lights from the malec�n. He sighed as his eyes moved to the line of coconut palms dotting the water's edge. In Spanish he explained to me the mystery and majesty that is La Paz. And it is mysterious and majestic, you know. It just is. 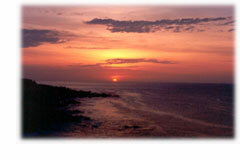 La Paz, located near the tip of Baja on the Sea of Cortez, is more Europe than Mexico to me. It has an understated, adventurous elegance to it-but with just a hint of that renegade adventurous spirit. Maybe that's because it was originally populated by pirates back in the early days. Some of the battles of the Mexican-American War were fought in its streets. This salad is a seafood lover's delight, and the moment you take your first bite, you'll be convinced that you're sitting on the malec�n under a palapa at the edge of the Sea of Cortez watching the pelicans cruise back and forth in the bay, bathed in the pale glow of the street lights. Be a little bold and serve chilled Pacifico or Corona Beer with this one. Sip it and a balmy, desert breeze will immediately waft its way through your dining room or back yard. You'll hear strains of Mexican music in the distance and whatever stress you've been experiencing will mysteriously vanish. This incredible salad serves two hungry people for lunch or a light dinner. On the bottom of a large salad bowl, layer shrimp, green onions, salsa, carrots and tomatoes. Add grated Parmesan and lettuce as top layer. Refrigerate up to one hour. Prior to serving, prepare salad dressing by mixing together salad dressing, seafood cocktail sauce, sour cream sauce, salt and pepper. Pour over salad and toss gently. 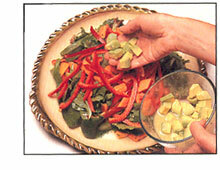 Serve salad on chilled plates and top each serving with half the guacamole mixture. Place an olive on top of the entire salad. Serve immediately and enjoy! Quick, easy and dyn-o-mite, this salad is guaranteed to transport you right to a palapa on the beach, where you're eating barefoot, with your feet digging aimlessly in the grainy sand, sand that's still warm from the leftover heat of the just-set-sun.Can you hear the waves quietly lapping against the shore in front of you as the new moon cuts a silver sliver in the early evening sky? Ah yes. Here comes the first star. Serves two as a meal.